Dirty cops never stay clean. After being filmed getting a little too rough with a suspect during a drug-bust, detectives Brett Ridgeman (Mel Gibson) and Anthony Lurasetti (Vince Vaughn) are told to hand in their badges and guns, and to take a six-week suspension without any pay. For both of these guys, this isn’t that great deal of a compromise, which is why it isn’t too long before they get into a line of some work with a high pay-grade. However, because they’re so desperate, they realize that the job they signed-up for is going to be much more threatening and dangerous than they ever expected and honestly, they have no clue whether or not they are going to make it out of this alive, money or no money. Weirdest hockey team I ever did see. 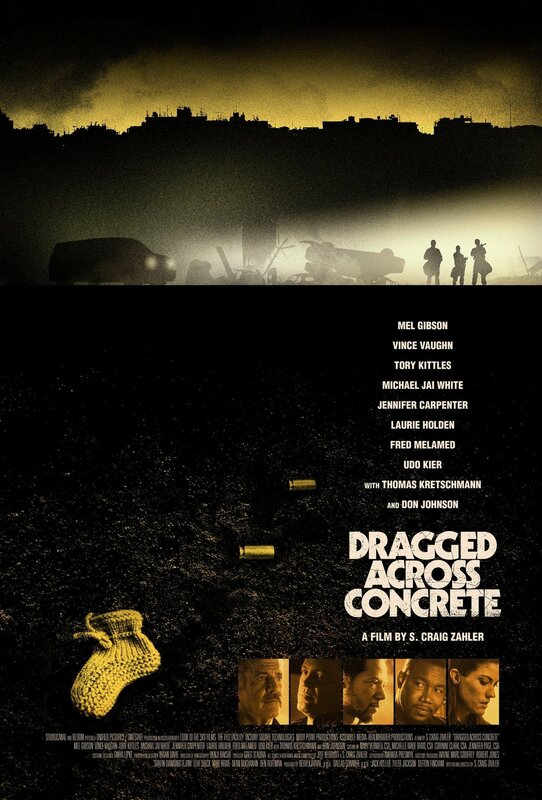 As is the case with writer/director S. Craig Zahler’s past two films (Bone Tomahawk, Brawl in Cell Block 99), there’s a certain amount of dread that’s constantly built and felt throughout the two-and-a-half-hour run-time of Dragged Across Concrete. There’s just something about Zahler’s standard, yet detached direction that makes everything much more intense and almost scary, because he plays it so matter-of-fact, at times, that it’s almost like watching a documentary. A documentary which, mind you, you want nothing to do with, but because you’re already there and so close up to the action, you have nowhere to go so you just sit there and wish that it would just end already. And when it does, a huge weight is finally lifted off your shoulder. This may not sound like the greatest praise for a movie, but for Dragged Across Concrete, it’s clearly the reaction it’s going for. It’s not meant be sweet, tender, and nice – it’s meant to be raw, gritty, in-your-face, unapologetic, and most importantly, and perhaps more controversially, mean. As is the case with Zahler’s other movies, his politics get called into question here, about whether or not these characters are just stand-ins for Zahler’s real thoughts about race, politics, liberals, and all that nonsense that seems to pop-up in everything everywhere you look nowadays. There’s a whole conversation dedicated to this kind of talk, but in a way, it’s fine, because Zahler is writing these characters and representing who they are, what they are, and really, the kind of world we are being sucked into. Mel with a gun. Uh oh. Which, if you look at the blankness and brutality of the violence here, isn’t all that attached from the real world. Zahler takes no prisoners here, and he’s not afraid to really let things roll as slowly as can be, which as a result, continuously builds-up tension, even in the spots where we’re not the least expecting it to. That’s the sign of a good director, who knows and understands how these kinds of thrillers work, without having too jazz it up with a whole bunch of gimmicky camera-stuff and witty banter between characters to ironically break up the tension. Okay, that sort of happens here, but hey, it works! Out of his three, Dragged Across Concrete is probably the least accomplished of Zahler’s flicks, but that’s only because he seems to be trying something new and a little different, what with these characters (all of whom seem to get at least some sort of development), this ensemble (who are all great), and just how the story plays out (obviously, this is all spoilers that I won’t dive into). And when you’re taking risks, it’s sometimes hard to fully connect. Eventually, Dragged Across Concrete gets a little predictable and silly, but it’s always compelling to watch and sometimes, that’s all you need. Consensus: For a movie as brutal and raw as Dragged Across Concrete, it’s also surprisingly quiet, slow, and a little meandering, adding more tension and dread, the longer it goes on and clocks out at a surprisingly quick two-and-a-half-hours.